Sometimes I feel downright silly working so hard to grow a garden full of delicate vegetables and herbs and an orchard full of fruits and brambles, when so many carefree and hardy wild foods grow all over the place, free for the picking! 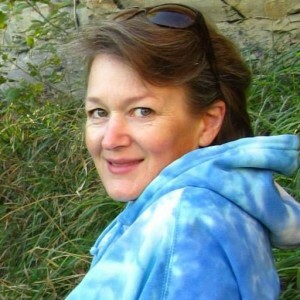 I wrote an earlier post about this, especially highlighting a fabulous book on wild foods, called The Wild Table, by Connie Green. If you’re interested, you can check it out right here. Just on our few acres, right now I can think of several nutritious wild foods that I could waltz out at any time to pick and eat: dandelion, nettle, violet, dock weed, purslane, and the loveliest of all these, lambsquarters. 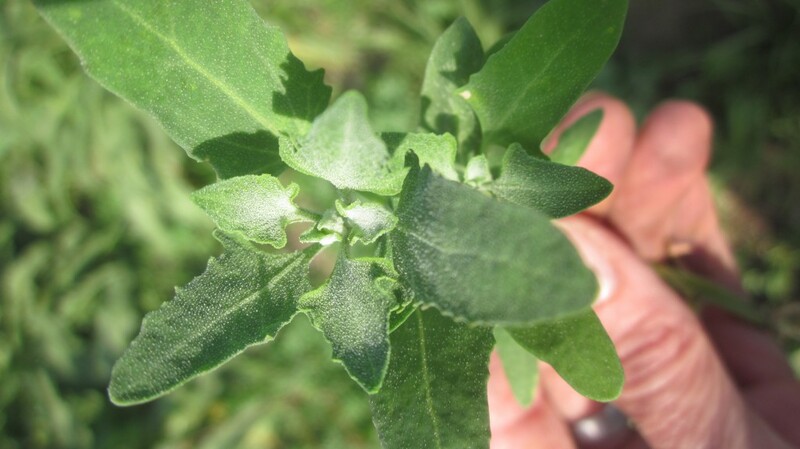 Lambsquarters, or Chenopodium album (some write it as “lamb’s quarters”) is also called white goosefoot or fat hen and grows wild nearly everywhere. It’s coming up at our place, the Old Depot Farm right now, and will soon threaten to take over our acres. The plants are very small now, but if you let them go, they’ll easily grow several feet tall and you’ll need a machete to take them down. It’s best, if you want to eat them, to cut them when they are small and tender, so now’s the time! Lambsquarters are about as common-looking as weeds come, but it will surprise you how delicious they are! If you want to add this nutritious green to your diet every day, it’s quite simple while out weeding or planting or even walking the dog, to pull a few handfuls of these wonderful greens and have the basis of a delicious soup or stir-fry, or a nice addition to a green salad or a sandwich! 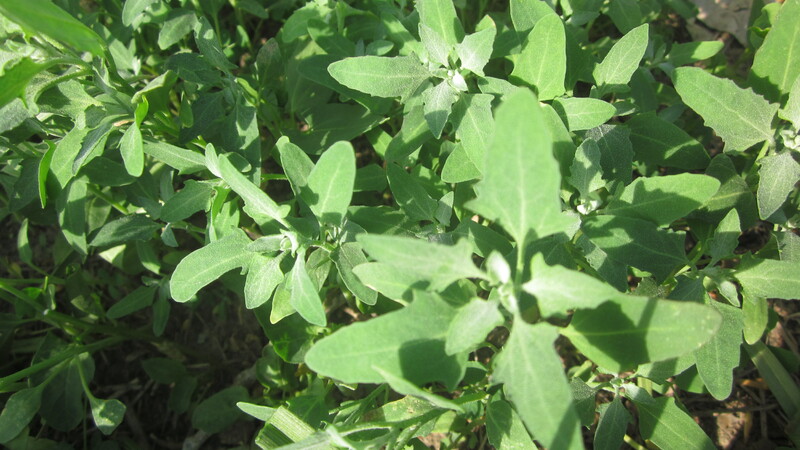 Lambsquarters are wonderful wild plants that are completely edible, versatile, delicious and nutritious. You can use them wherever you would use spinach, raw or cooked. Steam these greens like spinach and serve as a side dish, or put into an omelet or lasagna. They are one of my very favorite wild foods, and actually I think they taste better than spinach, especially steamed with a bit of butter and some fresh-ground salt and pepper, or a dash of olive oil and vinegar. Have I talked you into trying some lambsquarters at your house yet? In this close-up, you can see that the leaves are a triangular shape, and are slightly fuzzy. I found the following recipes in this excellent website where you can find even more recipes for lambsquarters and many other wild foods. Gather any of the tender leaves and stalks while they are small. I prefer to let some keep growing in my garden and keep the tender shoots well trimmed. It is also handy to be able to use the small plants that you have just weeded from around your garden plants. Steam these greens for several minutes until they turn a bright green, only a few minutes, because you do not want them to get mushy. Drain the water from the greens and place onto your serving dish. Pour a dash of olive oil onto each serving. Top with minced fresh garlic and a bit of Bragg’s or your favorite seasonings. Voila! In just a few minutes, you have made the best plate of greens that this world could offer! 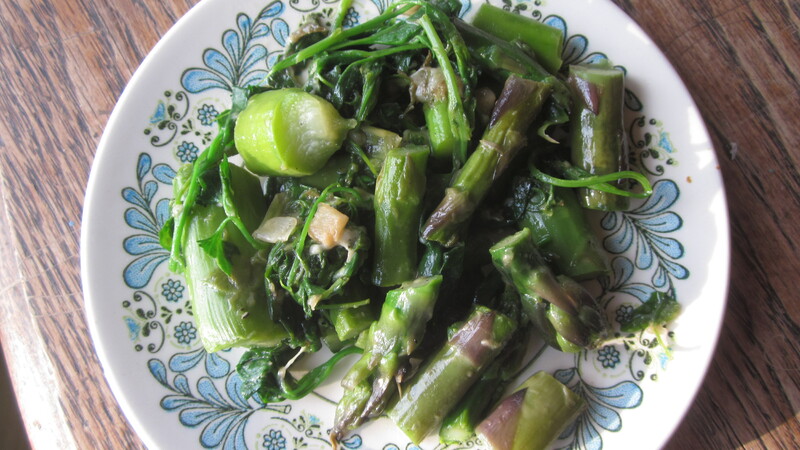 In this dish, I sauteed chopped garlic and onion in a bit of olive oil, then added some chopped asparagus for a brief steaming, and then threw in a couple handfuls of lambsquarters and sauteed them briefly, until they were wilted. Quick, easy, and quite delicious! But don’t stop now. We’re just getting warmed up. Saute onions in butter until soft. Add flour and cook until mixture browns a bit. Add salt and pepper. Cook for a few minutes over medium heat. Add milk and lambsquarters. Then heat gently until heated through, but don’t let it boil. You can serve it at this point, or you can whirl with an immersion blender or in a food processor to make a creamier soup. Simple and yummy. You can use vegetable or chicken broth instead of the milk, if you like, and a chopped potato or two is a good addition! Now we’ll get a little fancy with a recipe for Lambsquarters Spread! You can eat this spread with crackers, as a sandwich spread, cooked into pasta, or even with fresh vegetables for dipping. Heck, you can smear it on an old boot and it’ll be tasty–it’s that tasty! Chop the garlic in a food processor, or by hand. Dice the onion and add. Add the remaining ingredients and process or chop until fine. Makes about 2 to 3 cups. This delicious spread will keep, tightly covered, in the refrigerator for 5 to 7 days. 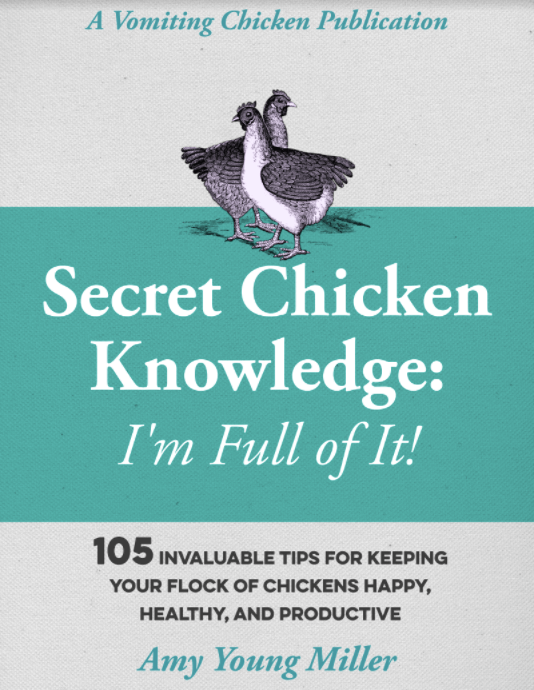 Although if you let everybody know that it’s there, trust me, it won’t last that long! There you go, Gentle Readers, four smashing and quick ideas for what you can do with a few handfuls of lambsquarters. Have fun cooking with these wild greens! I’ve never seen this herb growing close to me. What a great idea to eat it the way you suggest. I’d be too afraid to eat anything growing close to me for fear of pollution from fumes of a constant stream of traffic going by. Francene, sweet lady, you just come visit me and I’ll fix you up a mess of these lovely greens. Not much fumes or pollution out at our place! This is so cool. I love the idea of eating a wild growing “weed”. Love your new picture in the header too! Who knew there were so many ways to cook a weed? Now you’ve made me want to go eat it. My kids eat dandelion leaves all the time, even though they are a bit bitter. If you mix them with lettuce and pour salad dressing on them, they’re not too bad, and very nutritious. Lambsquarters, in my humble opinion, are more tasty (and not bitter!) than dandelions, and just as plentiful! I don’t seem to be able to find any around me. I’ll keep looking. I would ask you for some seed when they go to seed but I do plan to be heading south soon and if I have my way, I might just miss next years planting season. Ah, Chef, say it isn’t so! I’ll save you some seed, anyway, just in case you end up in the states next spring! Chef Williams, in WI we seem to get them in June and the take over in July and August. What a coincidence! We went to a library book sale today and picked up a Weight Watchers cookbook with recipes from the Culinary Institute of America. One of the recipes was a Spinach Avocado Dip that was made with cooked spinach, avocado, plum tomatoes, onion, a little lime juice and cilantro – and low fat buttermilk. You pureed the spinach, added to mashed avocado, and added the chopped plum tomato and onion. Sounds a little bit like your recipe, doesn’t it? Anyway, I’ve eaten lambs quarters many times – my son, growing it up, loved it in a spinach pie (using egg roll wrappers and feta cheese). For some reason, we don’t have near as much of this coming up in our community garden anymore than used to even a few years ago. Not enough to eat. I miss it! That recipe sounds delicious! I’m happy to hear of somebody else who has eaten this delicious wild green. Not many folks have tried it! Thanks for your sweet comments. Let me know if you try the soup, okay? I can’t say as I’ve ever seen this weed growing around here, but the recipes sound yummy and I am sure I could use them with spinach as well. Thank you for sharing! Yes, Sheri, all those recipes should work just fine with spinach! I make cracker cheese out of goat milk. What do you think of putting minced up lambsquarter in that? I think that sounds delicious! If it were me, I’d steam the chopped lambsquarters first, and then drain and pat them dry, though, before adding to the cheese, to avoid spoiling your cheese with too much moisture. Does that sound good to you? Last fall I allowed a plant to go to seed and then broadcast seeds just by the front wall of the house in front of my living room. This spring, I have a forest of edible greens. Steamed a bunch and chopped up the leaves to include in an omelet with cheese and Genoa salami this morning. Off the charts delicious! Whoa. Andrew. I’ve never even once thought about planting lambsquarters. I’m so glad you shared this with me. I actually prefer the taste of lambsquarters to that of spinach, and it grows wild here in Nebraska all season. Love this idea! This old Cherokee Indian has to have wild greens! It’s something I grew up with and have never gotten my fill. My wife, a first generation Italian, likes lambs quarters more than spinach. That makes me happy…. we eat both, but the wild greens are always a treat. Make frittatas the Italian way with the wild greens. Fantastic! Awesome idea, Horace! Thank you! !